We reached that point in our journey there was a very obvious fork in the road. As parents we had to make a decision and a hard decision it was. Confronting me was my ideals as a parent how great my vision was for raising my child, how wonderful their life would be came crashing down. Instead I see my precious boy imprisoned by fear and no-one could hear his voice, he was silent without a voice and we were struggling. Struggling to give him the confidence he needed, struggling to know what do do when nobody really knew how to help us to help him. Two pivotal moments helped us to make this decision. My boy's anxiety had gotten so bad that he was assessed not very thoroughly I might add, by a well known psychologist in Perth. He struggled so much that she recommended that we go through the process of diagnosing my beautiful son with autism. This opinion threw me and I wondered had I missed everything. I wasn't confident with the opinion of this psychologist as her opinion including a sense, some vague feeling that he was on the spectrum. And it was accompanied by the line I have 20 years of experience, this invalidated what she said in my eyes (I'm naughty I know). Did I go through some soul searching you bet I did, I consulted people I trusted his psychologist and a dear friend to make sure that I hadn't missed anything. But the criteria never fit him and his behaviour for many reasons. I found this great article on a website which compares Selective Mutism and autism and the characteristics that makes Selective Mutism unique you can read this article here. Whilst this experience was so confronting and challenging I learnt something my boy's situation was so severe that he could be misdiagnosed. Once I worked through the emotions that I encountered with the assessment, I was able to concentrate on the working with my boy. The second pivotal moment for us come when after a session with his psychologist, I was talking with him about why he finds it hard to talk he said "I try to talk but the words don't come out". Honestly I can't remember how I replied but I believe in my heart that is the moment that I made my decision we had to do everything in our human power (and some of God's) to help my boy. If he is working hard and trying his hardest then as parents we need to do the same. Now you might be wondering where the fork in the road comes in? Last year you might remember me doing a post about medication and the effects on SM and what the research shows regarding anti anxiety medication and how it can help those who are suffering from Selective Mutism. Part of this research was as a result of our paedatrician giving us a script for that next step. At the time we weren't happy to go ahead with that avenue of treatment. But right at that moment when my boy said to me "I try to talk but the word's won't come out" was when I knew the time was right for us. Now there are so many background components of my boy's life that had to be just right so that we could proceed with this. Such as funding for therapy, the right environment at school and so much more. Just the other day I had to go to the doctor's to get a script for my boy as the silly chemist in Perth had lost it (long story) and I realised that I was still processing how I felt. I never thought my son would find life so hard that he needed medication to be ok. While waiting in the doctor's waiting room so much went through my mind what if the GP judges me, what if they question me and don't even give me a script at all. What if they tell me off and give me the kids don't need anti anxiety drugs. Just to go into that doctor's office to find out it was ok but I felt so awkward, raw and emotional having to explain a little to someone about what is going on. What was confronting to me is that why is it when it associated with mental health the rules that apply to every other sickness, don't apply to mental health. Just a few days earlier I had a discussion with my trusted GP about how to go on medication for mental health is actually ok and it shouldn't be any different. But the stigma remains. I know family wise it is not something that is encouraged is that the right word, I realise that is a little of the reason why I kept it within our family so that we could allow him and the medication work without any pressure. So we didn't tell anyone for a few months just while we were slowly introducing the meds and upping to the intended dose. 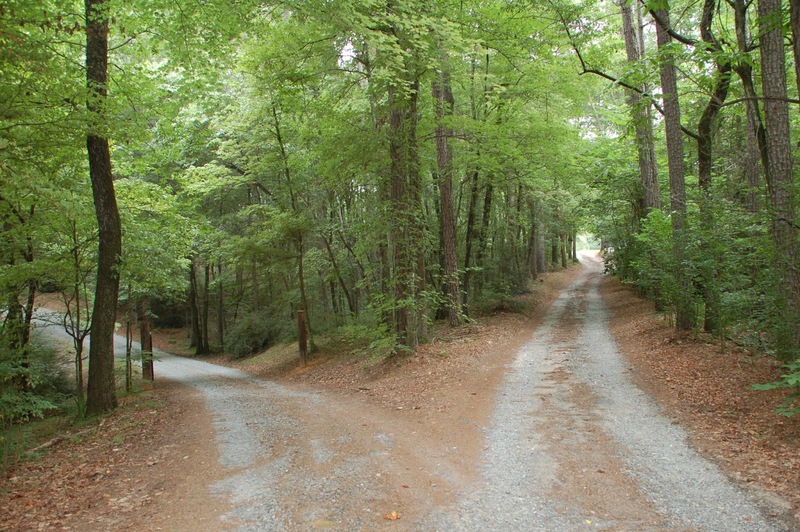 Making a decision can really be full on, just like the above picture the options don't feel clear at all. This one was one of our hardest that we made, it felt like this at first. But later as the journey wore on, the right time was upon us. It felt more like the fork at the top of this post. Can we see the where the fork leads nope! Oh I wish we could but we can't. This I know sometimes we have to make the hard decisions it doesn't matter what everyone else thinks, it matters what is best for your child. It means making a researched decision (believe me that side effects list freaks me out) and looking at all the options. When the time is right you need to be 100% behind what you are doing and for us it was a little easier keeping it to ourselves just for a little bit. Next post I hope to write more about how the medication is working for us and the interesting journey it was when it started!!! Not for the faint hearted this parenting business not at all. I pray that God will redeem your son from any inherited traits of fear and anxiety with the precious blood of Jesus Christ according to 1 Peter 1:18-19. I pray that God will restore his mind and soul to the way it should be according to Psalm 23:3. Jesus carried all of your son’s sorrows and pain; the punishment that brought your son peace was upon Jesus and by Jesus’ wounds your son is healed according to Isaiah 53:4-5. The Lord is close to your son’s broken-heart and will save his crushed spirit (Psalm 34:18). Your son does not have a spirit that makes him a slave to fear, he has one that is crying out to God ‘Abba, Abba, My Father’ (Romans 8:15). Kerry, you should pray in tongues or pray in the spirit over your son and baptise your son in the Holy Spirit. It is simple to do and very powerful. The weapons we fight with are not weapons of the world; they have divine power to demolish strongholds (2 Corinthians 10:4).You can pray “Father God in the name of Jesus, cleanse me with the blood of Jesus Christ. Baptise and fill me with your Holy Spirit. In faith I receive your gift of speaking in tongues. Thank you Jesus. Amen”. Now open your mouth and cry out to God, from your mouth a language you don’t understand will come out. Don't be discouraged if you get only a few words or if what you say sounds like gibberish, persist in faith and more words will come. God will hear you and He will save your son. When you pray in tongues your spirit cries out all of your worries, fears and troubles to God. Your spirit prays when you don’t know what to do or say. God will strengthen your son’s spirit to stand up against this fear. “I am the Lord, the God of all mankind. Is anything too hard for me?” Jeremiah 32:27. And remember that God chose the foolish things of this world to shame the wise, He chose the weak things of this world to shame the strong, He chose the lowly things and the despised things and the things that are not to nullify the things that are so that no one may boast before Him. 1 Corinthians 1:27-29. God has got a great plan for son’s life that is filled with hope and a future. Jeremiah 29:11. “Finally, be strong in the Lord and in His mighty power.” Ephesians 6:10.